1st Battery: White Oak Church, Virginia. Six 12-pdr Napoleons. The battery was assigned to First Division, Sixth Corps, Army of the Potomac. Captain William H. McCartney commanded. 2nd Battery: No return. Captain Ormand F. Nims commanded this battery, assigned to the Fourth Division, Nineteenth Corps, Department of the Gulf. As of January 1863, the battery reported six 6-pdr rifled field guns (if strictly interpreted, 3.67-inch caliber, but 3.80-inch sometimes were identified as such). Reports indicate the battery’s duty station was Baton Rouge, Louisiana. 3rd Battery: Falmouth, Virginia with six 12-pdr Napoleons (corrected from the previous quarter’s return… see 5th Battery below). Assigned to the First Division, Fifth Corps and under Captain Augustus Martin. 4th Battery: At Baton Rouge, Louisiana with four 12-pdr Napoleons and two 3-inch steel rifles. This battery was assigned to the Third Division, Nineteenth Corps, under Captain George G. Trull (though Lieutenant Joseph B. Briggs was temporarily in command during part of the winter). The nature of the 3-inch rifles is a question for me. With Sawyer and Wiard weapons of that caliber associated (by presence of surviving examples) with Massachusetts, but no direct citations at my grasp, I’ll leave full identification open. 5th Battery: At Falmouth, Virginia with six 3-inch rifles. Also assigned to 1st Division, Fifth Corps. The battery was under Captain Charles A. Phillips. The previous quarter, this battery supposedly had six 12-pdr Napoleons. I think this a mix-up between the 3rd and 5th Batteries by the clerks, being corrected here in the first quarter of 1863. 6th Battery: No return. The battery was assigned to First Division, Nineteenth Corps, under Lieutenant William W. Carruth, with four 6-pdr Sawyer guns and two 12-pdr howitzers. 7th Battery: Suffolk, Virginia with six 3-inch Ordnance rifles. Assigned to the Seventh Army Corps, commanded by Captain Phineas A. Davis. 9th Battery: Fort Ramsay, Virginia. Six 12-pdr Napoleons. The battery was part of the defenses of Washington. The 9th Battery Light Artillery was part of Abercrombie’s Division with Lieutenants Charles Erickson and later John Bigelow, commanding. Of course, we know the battery went on to some renown for action later in the year. 10th Battery: Poolesville, Maryland with six 3-inch Ordnance Rifles. The battery was assigned to the defenses of Washington, assigned to the Corps of Observation. Captain J. Henry Sleeper commanded. 11th Battery: Centreville, Virginia with six 3-inch Ordnance Rifles. Also part of Washington’s defenses. This battery was assigned to Casey’s Provisional Division and commanded by Captain Edward J. Jones..
12th Battery: At New Orleans, Louisiana, with an annotation, “Stores turned over March 27 to…” a Lieutenant who’s name is illegible to me. Lieutenant Edwin M. Chamberlin commanded this battery of unattached artillery in the Nineteenth Corps. The battery arrived in Louisiana that winter and performed garrison and guard duties through the winter and early spring. 1st Battery: 396 shot, 74 shell, 251 case, and 131 canister for 12-pdr Napoleon. 3rd Battery: 192 shot, 96 shell, 387 case, and 96 canister for 12-pdr Napoleon. 4th Battery: 136 shot, 64 shell, 264 case, and 112 canister for 12-pdr Napoleon. 9th Battery: 272 shot, 242 shell, 191 case, and 191 canister for 12-pdr Napoleon. Of note, in each battery were were always more shot than canister. And on most reporting lines more shell and case. While there are more canister on hand than one might expect, the majority of the rounds on hand reflected the tactical preference for artillery use. I often wonder if the reported quantities of canister reflected some “over stock” due to the issue process. As issue was often by chest (akin to what modern armies do with a “unit of fire”), there may have been a portion of unused canister retained. 4th Battery: 40 canister, 240 percussion shell, and 120 fuse shell for 3-inch rifle. 5th Battery: 80 canister, 120 percussion shell, 413 fuse shell and 540 bullet shell for 3-inch rifle. 7th Battery: 205 canister, 198 percussion shell, 284 fuse shell, and 750 bullet shell for 3-inch rifle. 10th Battery: 123 canister, 110 percussion shell, 240 fuse shell and 760 bullet shell for 3-inch rifle. 11th Battery: 117 canister, 512 percussion shell, and 575 bullet shell for 3-inch rifle. 5th Battery: 80 Schenkl canister for 3-inch rifles. 10th Battery: 15 Schenkl shell for 3-inch rifles. Thus by a wide margin the Massachusetts artillerists had Hotchkiss projectiles for the first quarter. 1st Battery: Thirteen Army revolvers, twelve cavalry sabers, and seven horse artillery sabers. 3rd Battery: Twelve Army revolvers, eight cavalry sabers, and twenty-four horse artillery sabers. 4th Battery: One .54 caliber carbine, seven Army revolvers, and forty-two horse artillery sabers. 5th Battery: Six Army revolvers and forty-six horse artillery sabers. 7th Battery: Nineteen Army revolvers and 143 horse artillery sabers. 10th Battery: Twenty Navy revolvers and twenty horse artillery sabers. 11th Battery: Twenty Army revolvers and twenty horse artillery sabers. Other than the 7th Battery’s large number of sabers, all within reason! 1st Battery: No return. This battery was assigned to Nineteenth Corps, Department of the Gulf, and had a very active winter operating in Louisiana. Reports from the department indicate the battery was under Captain E. W. Thompson, with four 6-pdr rifled guns and three 12-pdr howitzers. Lieutenant John E. Morton replaced Thompson early in the spring. 2nd Battery: No location given, but reporting six 3-inch Ordnance rifles. Captain James A. Hall’s battery was assigned to First Corps, Army of the Potomac, in Colonel Charles S. Wainwright’s brigade. They wintered around near White Oak Church (Fletcher’s Chapel is mentioned). 3rd Battery: Stationed at Fort [Battery] Jameson, Maryland, but no guns indicated. Captain James G. Swett’s battery was stationed in the Defenses of Washington, in a battery part of the larger Fort Lincoln. The 3rd had a varied history to this point in the war, most recently working with pontoons. Near the close of the quarter the battery became part of the 1st Maine Heavy Artillery (temporarily as Battery M of that regiment). 4th Battery: At Harpers Ferry, Virginia with six 3-inch Ordnance rifles. Captain O’Neil W. Robinson, Jr. commanded this battery, assigned to Kelley’s Division, Eighth Corps, Middle Department. 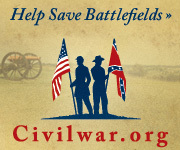 5th Battery: Reporting at Fletcher’s Chapel, Virginia with six 12-pdr Napoleons. Captain George F. Leppien commanded this battery, which also fell under Wainwright’s brigade, supporting First Corps. 6th Battery: At Warrenton Junction, Virginia with four 12-pdr Napoleons and two 3-inch Ordnance rifles. The location is likely reflecting the August 12 reporting date. The battery supported the Twelfth Corps at this time and was posted to Dumfries, Virginia. Lieutenant Edwin B. Dow replaced Captain Freeman McGilvery in command. So we can fill in some of the blanks and make some minor corrections. Relatively speaking, the Maine batteries were in order.. from the clerk’s point of view. 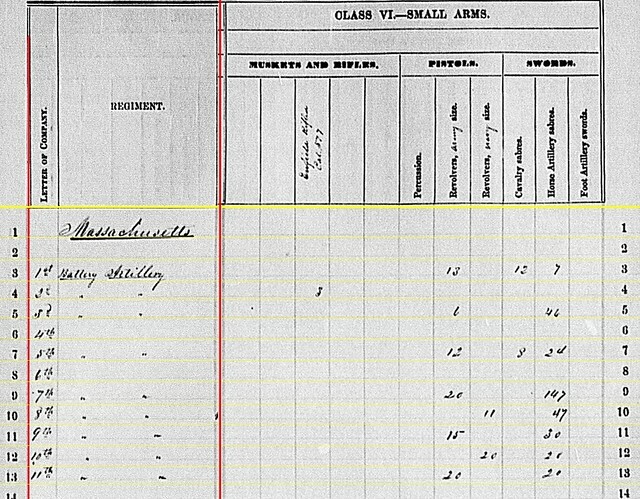 Note the artillery assigned to the 9th Maine Infantry dropped from the list for first quarter. 5th Battery: 288 shot, 95 shell, 289 case, and 96 canister for 12-pdr Napoleon. 6th Battery: 192 shot, 64 shell, 149 case, and 64 canister for 12-pdr Napoleon. 2nd Battery: 137 canister, 156 percussion shell, 354 fuse shell, and 146 bullet shell Hotchkiss for 3-inch rifle. 4th Battery: 120 canister, 320 fuse shell, and 699 bullet shell Hotchkiss for 3-inch rifle. 6th Battery: 100 canister, 24 percussion shell, 150 fuse shell, and 126 bullet shell Hotchkiss for 3-inch rifle. 2nd Battery reported 402 Schenkl shells for 3-inch rifle. 3rd Battery: 105 Army revolvers and one cavalry saber. 4th Battery: Eighteen Navy revolvers and twenty-three cavalry sabers. 5th Battery: Sixteen Army revolvers and seventeen cavalry sabers. 6th Battery: Seven Army revolvers and twenty-two horse artillery sabers. It would have been nice if the 1st Battery’s report was here to compare. 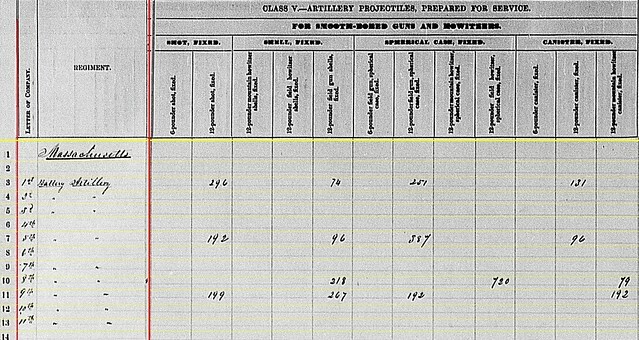 But we see 3rd Battery, stationed in the Washington defenses, likely had a pistol for every man. Continuing through the summaries in the order of presentation, the next sections are for batteries from Minnesota and Maryland. What of Maine? And shouldn’t Massachusetts and Michigan be ahead of Minnesota? 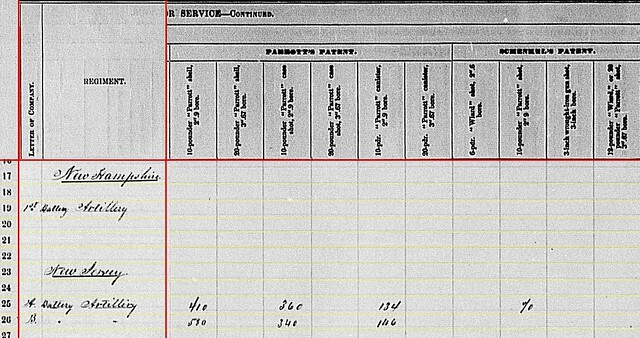 Clearly the clerks of the Ordnance Department placed line count and page layout above ease of data retrieval. We’ll see those other states represented… after Missouri! 1st Battery: Received on April 14, 1863, their report gave a location of Lake Providence, Louisiana, with two 12-pdr field howitzers and two 3.67-inch (6-pdr) rifles. When Grant’s ponderous Thirteenth Corps was reorganized, the battery moved with its parent, the Sixth Division, into Seventeenth Corps. During the winter the division moved from Memphis to Lake Providence, with other formations focused on Vicksburg. Freshly promoted Captain William Z. Clayton commanded. 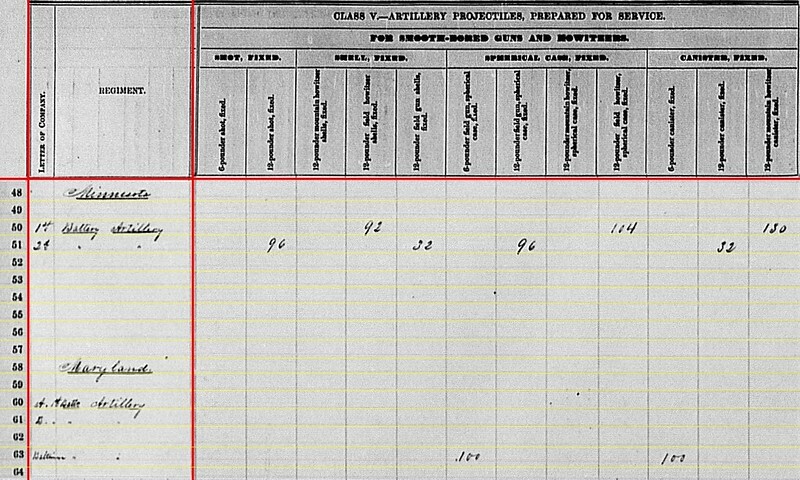 2nd Battery: On paper, we see this battery’s report arrived in Washington on April 15, claiming an advanced position at Chattanooga, Tennessee. Something is certainly amiss with the entry. Two 12-pdr Napoleons and four 10-pdr Parrotts is correct. But the battery was actually at Murfreesboro with the rest of the Army of the Cumberland. With the reorganization, the battery moved to First Division, Twentieth Corps. Captain William A. Hotchkiss relinquished command of the battery to serve as the artillery chief. Lieutenant Albert Woodbury assumed command. 3rd Battery: As mentioned above, this battery was still organizing at the reporting time and thus not on the summary. Men from the 10th Minnesota Infantry transferred to form the battery. Captain John Jones commanded. Battery A: The report received on June 23, 1863 indicated the battery wintered around White Oak Church, Virginia and possessed six 3-inch Ordnance Rifles. Captain James H. Rigby remained in command. The battery was part of Sixth Corps at the time. Battery B: No date on the return, but the battery was also posted at White Oak Church. The battery reported four 3-inch Ordnance Rifles. Captain Alonzo Snow commanded. At the start of the quarter the battery was also part of the Sixth Corps. By mid-spring the battery was listed as “unassigned” within the Army of the Potomac, then later assigned to the Provost Guard Brigade. Baltimore Battery: The return of April 19 had the battery at Harpers Ferry, with one 6-pdr field gun and six 3-inch Ordnance Rifles. The battery, under Captain F. W. Alexander, was in Kenley’s Division of the Eighth Corps (Middle Department). Later the battery would transfer to Milroy’s Division at Winchester. 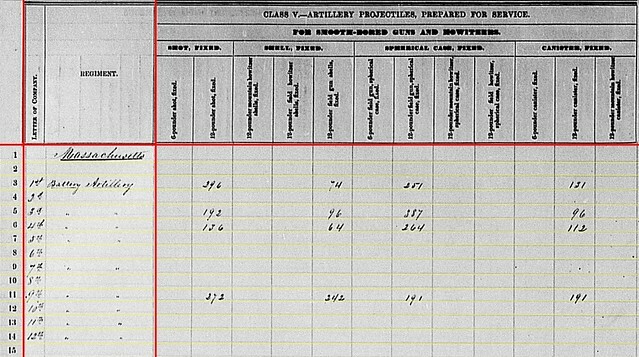 1st Minnesota: 92 shell, 104 case, and 130 canister for 12-pdr field howitzers. 2nd Minnesota: 96 shot, 32 shell, 96 case, and 32 canister for 12-pdr Napoleons. Baltimore Battery: 100 case and 100 canister for 6-pdr field guns. 1st Minnesota: 74 shot, 96 fuse shell, and 12 bullet shell for 3.67-inch rifle (labeled “Wiard” in the column header, but we know that caliber was also used by the rifled 6-pdr guns). Battery A, Maryland: 40 canister and 181 bullet shell for 3-inch rifles. Battery B, Maryland: 120 fuse shell and 452 bullet shell for 3-inch rifles. Baltimore Battery: 150 canister, 616 percussion shell, and 712 bullet shell for 3-inch rifles. We cannot “cut down” the next page due to the various projectiles reported. Battery A, Maryland: 32 shell, 527 shrapnel, and 80 canister for 3-inch rifle. 2nd Minnesota: 416 shell and 149 canister for 10-pdr (2.9-inch) Parrott. 2nd Minnesota: 15 shot for 10-pdr Parrott – reminder, these are Schenkl projectiles but made to work in Parrott rifles. Battery A, Maryland: 332 shell in 3-inch rifle caliber. Battery B, Maryland: 179 shell in 3-inch rifle caliber. 1st Minnesota: 126 canister for 3.67-inch (6-pdr) rifle caliber. 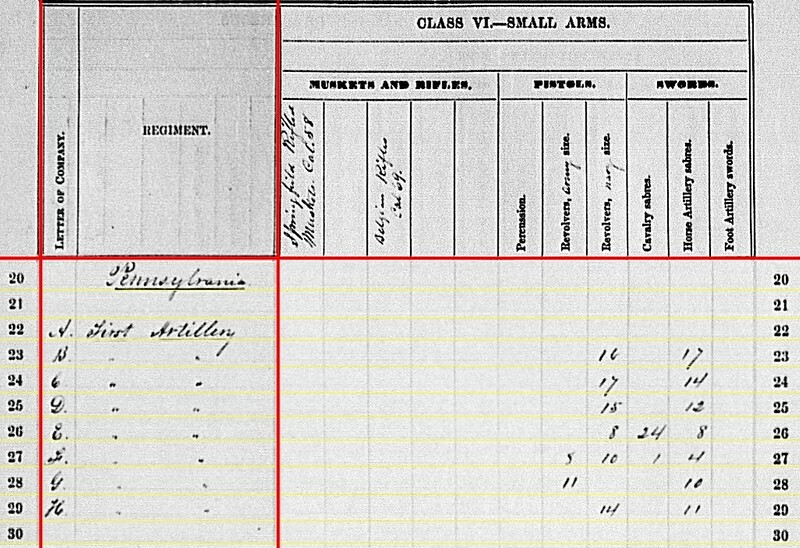 I do like that we see the 3.67-inch rifle caliber projectiles specifically called out on the forms. 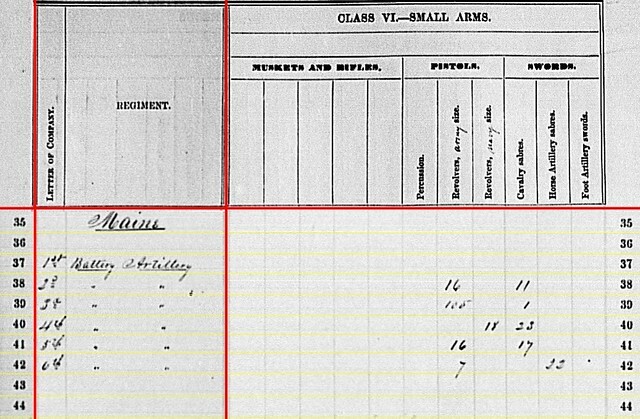 This underscores the difference – practical and administrative – between the James Rifles and the rifled 6-pdrs. 1st Minnesota: Eleven Navy revolvers and thirteen cavalry sabers. 2nd Minnesota: One Navy revolver and eight cavalry sabers. Battery A, Maryland: Eight Army revolvers and twenty horse artillery sabers. Battery B, Maryland: Fourteen Army revolvers and 102 cavalry sabers. Baltimore Battery: Six Springfield .58-caliber muskets, twenty Army revolvers, and thirty horse artillery sabers. We see, with one small exception, a desired small arms issue for artillery batteries. Perhaps this is the best rounded, complete set of returns submitted thus far. 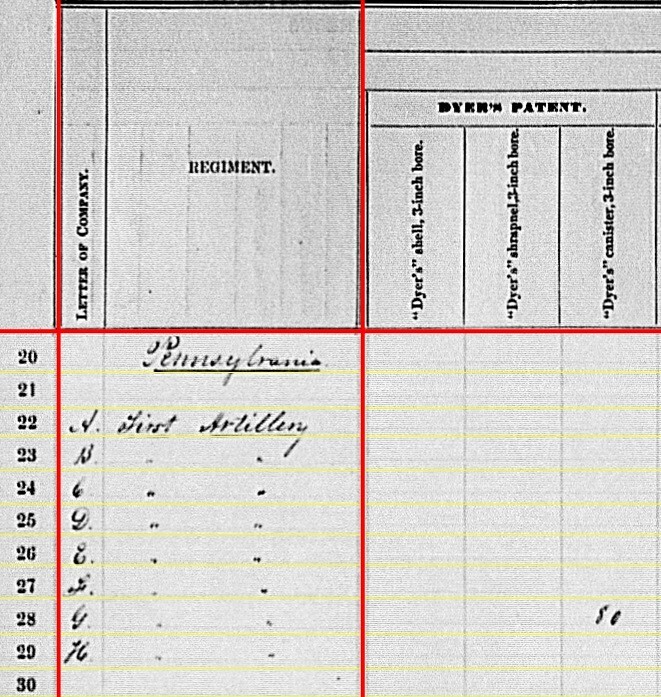 Just one question, about the location of the 2nd Minnesota battery. And we see every cannon on the report had some projectile to fire! Massachusetts’s naming convention was to number each light battery, instead of providing a regimental system (and keep in mind this stands separate from the Heavy Artillery which had a regimental system AND numbered separate companies) . However, in some correspondence those batteries were referred to by letter designations, as if there was a regimental system for the light batteries. In other words, sometimes 1st Battery was “Battery A”; 2nd Battery was “Battery B”; etc. For sake of convention here, I’ll use the numbered designations, just as the summaries offered. 1st Battery: White Oak Church, Virginia. Six 12-pdr Napoleons. The battery was part of Sixth Corps, Army of the Potomac, opposite Fredericksburg. 2nd Battery: Carrolton, Louisiana. No weapons listed. This battery was among those units involved with the Lower Mississippi (New Orleans and Baton Rouge) campaign and thus part of the Department of the Gulf. As of January 1863, the battery reported six 6-pdr field guns. 3rd Battery: Warrenton Junction, Virginia with six 3-inch Ordnance Rifles. Assigned to the Fifth Corps, Army of the Potomac. Captain Augustus Martin’s battery is credited with Napoleons at Antietam. And they had Napoleons at Gettysburg. There’s a longer story than I have room for here. 4th Battery: No return. This battery was also in the Department of the Gulf, with two sections posted to Fort Pike in December 1862. One section was at Carrolton, Louisiana with two 12-pdr Napoleons. 5th Battery: No location listed, but with six 12-pdr Napoleons. At the time in question, the battery was part of Fifth Corps. 6th Battery: No return. The battery was also part of the Department of the Gulf, under Captain William W. Carruth, with four 6-pdr Sawyer guns and two 12-pdr howitzers. A shame we don’t have more details in the summary. 7th Battery: Suffolk, Virginia with six 3-inch Ordnance rifles. Assigned to the Seventh Army Corps. 8th Battery: Mustered out, but reporting two 12-pdr field howitzers and four 6-pdr (3.67-inch) rifles. The battery had been part of the Ninth Corps before their six-month enlistment expired. 9th Battery: Fort Ramsay, Virginia. Six 12-pdr Napoleons. The battery was part of the defenses of Washington. Fort Ramsay was a forward section of the defenses, on Upton’s Hill. However, photos of the fort show siege weapons in place, not Napoleons. 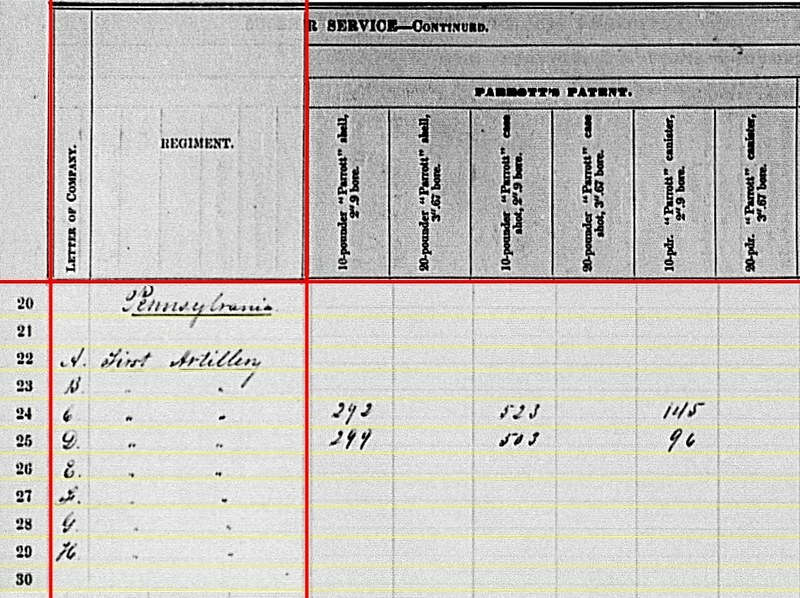 Further confusing things, the 9th Company (Unassigned) Massachusetts Heavy Artillery was also posted to Fort Ramsay at some point in the war. 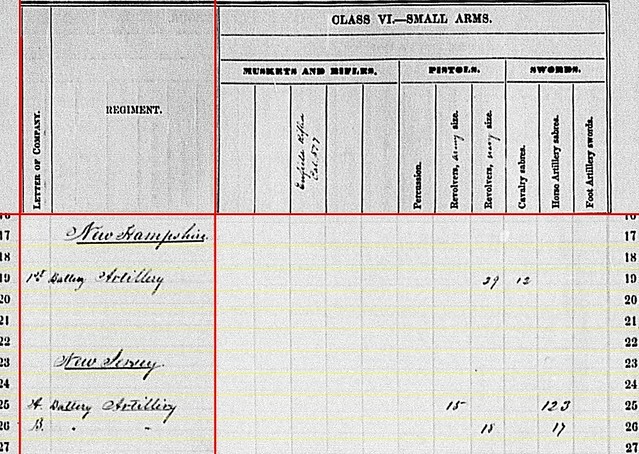 That aside for the moment, the 9th Battery Light Artillery was part of Abercrombie’s Division in December 1862. 10th Battery: Poolesville, Maryland with six 3-inch Ordnance Rifles. The battery was assigned to the defenses of Washington, but detached for duty. 11th Battery: Centreville, Virginia with six 3-inch Ordnance Rifles. Also part of Washington’s defenses. This battery was assigned to Casey’s Provisional Division. Yes, with Captain Richard Arnold’s January report in hand, it is possible to determine the number of cannons, and types, on hand for the Massachusetts batteries. Though there are still some questions that require chewing. 1st Battery: 12-pdr Napoleon – 296 shot, 74 shell, 251 case, and 131 canister. 5th Battery: 12-pdr Napoleon – 192 shot, 96 shell, 387 case, and 96 canister. 8th Battery: 12-pdr Napoleon – 218 shell. Also reporting 720 12-pdr field howitzer case shot and 79 canister for mountain howitzer. 9th Battery: 12-pdr Napoleon – 199 shot, 267 shell, and 192 case. Then 192 canister for the 12-pdr mountain howitzer. The last entry leaves us a small question. Certainly the use of 12-pdr howitzer case shot and canister in a Napoleon would work under the “if it fits down the bore we shoot it!” rule. However, I am inclined to think that is a transcription error for the 9th Battery. Likewise, for the 8th battery, I’m inclined to question if the stores included 12-pdr field gun shells or 12-pdr howitzer shells. Not that it mattered much for the 8th, as it would reflect quantities turned in by that time. 3rd Battery: 3-inch – 160 canister, 413 fuse shell, 540 bullet shell (case). 7th Battery: 3-inch – 212 canister, 192 percussion shell, 346 fuse shell, and 364 bullet shell. 8th Battery: 12-pdr (3.67-inch) – 18 shot and 1,464 fuse shell (!). 10th Battery: 3-inch – 125 canister, 115 percussion shell, 246 fuse shell, and 720 bullet shell. 11th Battery: 3-inch – 117 canister, 572 percussion shell, and 578 bullet shell. 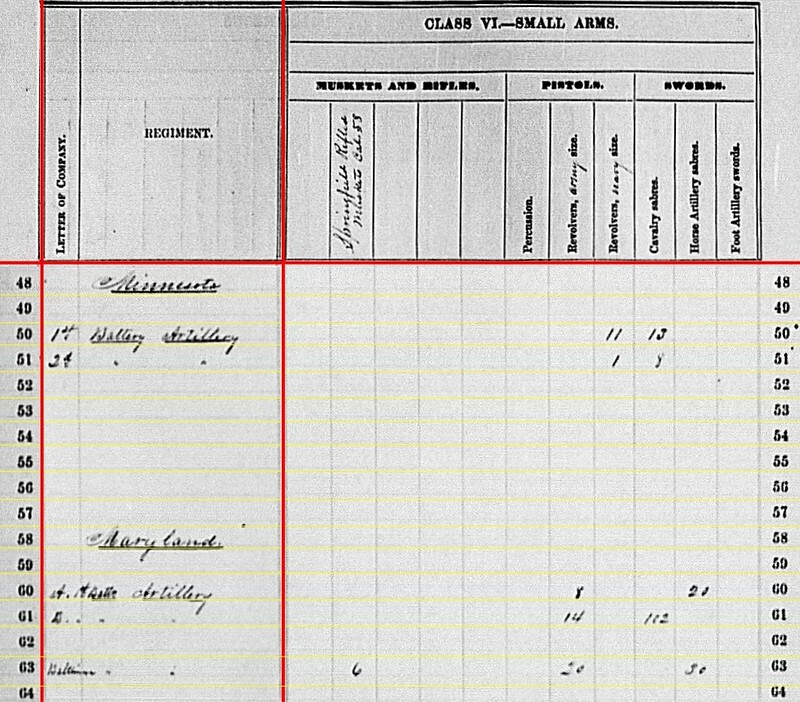 The 8th Battery must have “husbanded” their allotment of shells at Antietam…. Though I would caution that we don’t have documentation of the three batteries posted in Louisiana for the reporting period. 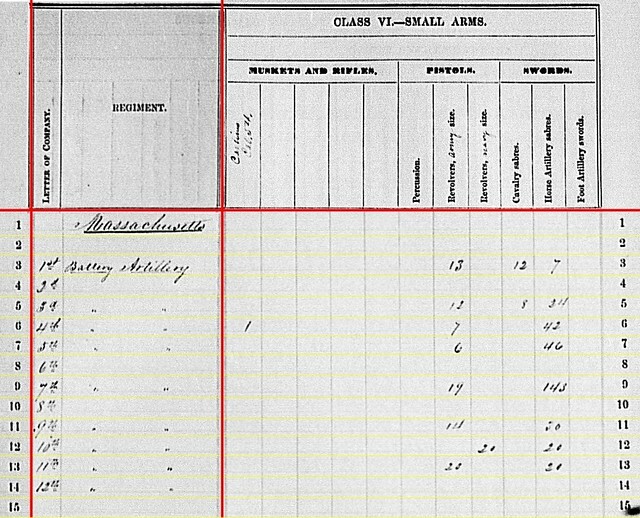 3rd Battery reporting 120 3-inch Schenkl shells for their Ordnance Rifles. 1st Battery: 13 Army revolvers, 12 cavalry sabers, and 7 horse artillery sabers. 2nd Battery: 3 Enfield .577 rifles. 3rd Battery: 6 Army revolvers and 46 horse artillery sabers. 5th Battery: 12 Army revolvers, 8 cavalry sabers, and 24 horse artillery sabers. 7th Battery: 20 Army revolvers and 147 horse artillery sabers. 8th Battery: 11 Navy revolvers and 47 horse artillery sabers. 9th Battery: 15 Army revolvers and 3 horse artillery sabers. 10th Battery: 20 Navy revolvers and 20 horse artillery sabers. 11th Battery: 20 Army revolvers and 20 horse artillery sabers. One would think that, coming from the home state of Ames and Colt, the Massachusetts men would be well equipped for small arms. I think this part of the summary, across all the states and batteries, is the section to give the most latitude. We have here the “reported” quantities, which might not directly correlate to the “issued” quantity, nor reflect the “acquired” quantity. Then again, we don’t usually measure a battery’s firepower by the number of pop-guns and long edged weapons.